Chatelaine Designs – finished part 3 tonight! My first piece of hardanger work. Not too bad looking really for a first effort. Might have been better to do a first attempt on a less tightly woven fabric – this is 32ct. I’m really pleased. I’ll do the beading tomorrow night. Huzzah! Outstanding work! This project is so beautiful and your stitching is gorgeous. Congrats and I can’t wait to see it with the beads. It looks fab so far Cathy, well done. The pictures of Max are adorable, look at those big eyes! Wow! That is pretty – you’ve done a beautiful job! Looks great! How many more parts to go? This is a stunning piece. 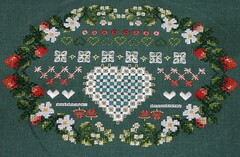 I couldn’t tell this is your first go at hardanger! Very pretty! I’m too scared to even attempt hardanger. Great job!! !